AMBRA BOOKS - Cornwall Antiquarian and Secondhand Books a selection from stock.
' PARISH OF ST. MABEN alias ST. MABYN. 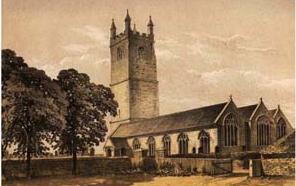 The Parish of St. Mabyn, which derives its name from the dedication of the Church, contains by admeasurement 4067a. 2r. 7p. It is irregular in form, and is bounded on the north by St. Tudy, on the east by Blisland, on the south-east by Helland, on the south-west by Egloshayle, and on the north-west by the last named parish and St. Kew. The land, generally, is fertile and adapted either to pasture or corn. The chief land owners are : The Viscount Falmouth, the Trustees of the late Sir William Molesworth, John Tremayne of Heligan, Esq., the Heirs of the late John Peter-Hoblyn, Esq., Francis John Hext and Richard Hambly Andrew, Esqs., and Mrs. Hooper. There is no other industry practised than the culture of the soil. Laborer's wages are 12s. or 13s. a week, and sometimes they have a cottage and garden free of rent. Besides this there are about two acres of land, contiguous to the Church Town, let as garden allotments, in portions of ten perches each, at five pence the perch. We specialise in buying and selling WEST COUNTRY and CORNWALL books.